Funding comes as the field marks its latest big discovery — the observation of the Higgs boson’s most common mode of decay. University at Buffalo scientists have received $1.45 million from the National Science Foundation (NSF) for research in high-energy physics, a field that uses particle accelerators to smash beams of protons into one another at near-light speeds, generating data that illuminates the fundamental laws of nature. Display of a candidate event for a W boson decaying into one muon and one neutrino from proton-proton collisions recorded by ATLAS with LHC stable beams at a collision energy of 7 TeV. (Image: ATLAS Collaboration/CERN). 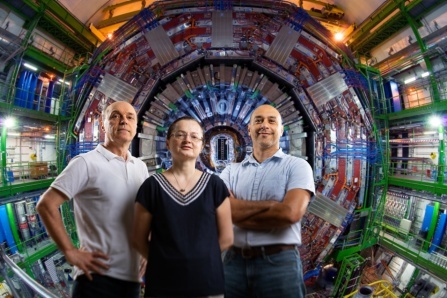 In a paper published today in the European Physical Journal C, the ATLAS Collaboration reports the first high-precision measurement at the Large Hadron Collider (LHC) of the mass of the W boson. This is one of two elementary particles that mediate the weak interaction – one of the forces that govern the behaviour of matter in our universe. The reported result gives a value of 80370±19 MeV for the W mass, which is consistent with the expectation from the Standard Model of Particle Physics, the theory that describes known particles and their interactions. The measurement is based on around 14 million W bosons recorded in a single year (2011), when the LHC was running at the energy of 7 TeV. It matches previous measurements obtained at Large Electron-Positron Collider[LEP] , the ancestor of the LHC at CERN, and at the Tevatron , a former accelerator at Fermilab [FNAL] in the United States, whose data made it possible to continuously refine this measurement over the last 20 years. The W boson is one of the heaviest known particles in the universe. Its discovery in 1983 crowned the success of CERN’s Super Proton Synchrotron , leading to the Nobel Prize in physics in 1984. Although the properties of the W boson have been studied for more than 30 years, measuring its mass to high precision remains a major challenge. Planning the next big science machine requires consideration of both the current landscape and the distant future. Around the world, there’s an ecosystem of large particle accelerators where physicists gather to study the most intricate details of matter. These accelerators are engineering marvels. From planning to construction to operation to retirement, their lifespans stretch across decades. But to get the most out of their investments of talent and funding, laboratories planning such huge projects have to think even longer-term: What could these projects become in their next lives? The following examples show how some of the world’s big physics machines have evolved to stay at the forefront of science and technology. Before CERN research center in Geneva, Switzerland, had its Large Hadron Collider, it had the Large Electron-Positron Collider. LEP was the largest electron-positron collider ever built, occupying a nearly 17-mile circular tunnel dug beneath the border of Switzerland and France. The tunnel took three years to completely excavate and build. 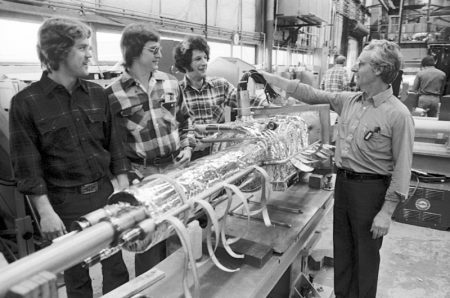 The first particle beam traveled around the LEP circular collider in 1989. Long before then, the international group of CERN physicists and engineers were already thinking about what CERN’s next machine could be. LEP’s designers chose an energy for the collider that would mass-produce Z bosons, fundamental particles discovered by earlier experiments at CERN. The LHC would be a step up from LEP, reaching higher energies that scientists hoped could produce the Higgs boson. In the 1960s, theorists proposed the Higgs as a way to explain the origin of the mass of elementary particles. And the new machine to look for it could be built in the same 17-mile tunnel excavated for LEP. Engineers began working on the LHC while LEP was still running. The new machine required enlargements to underground areas—it needed bigger detectors and new experimental halls. After LEP reached its highest energy in 2000, it was switched off. The tunnel remained the same, says Gillies, but there were many other changes. Only one of the LEP detectors, DELPHI, remains underground at CERN as a visitors’ point. In 2012, LHC scientists announced the discovery of the long-sought Higgs boson. The LHC is planned to continue running until at least 2035, gradually increasing the intensity of its particle collisions. The research and development into the accelerator’s successor is already happening. The possibilities include a higher energy LHC, a compact linear collider or an even larger circular collider. Decades before the LHC came into existence, a suburb of Chicago was home to the most powerful collider in the world: the Tevatron. A series of accelerators at Fermi National Accelerator Laboratory boosted protons and antiprotons to nearly the speed of light. In the final, 4-mile Tevatron ring, the particles reached record energy levels, and more than 1000 superconducting magnets steered them into collisions. Physicists used the Tevatron to make the first direct measurement of the tau neutrino and to discover the top quark, the last observed lepton and quark, respectively, in the Standard Model. The Tevatron shut down in 2011 after the LHC came up to speed, but the rest of Fermilab’s accelerator infrastructure was still hard at work powering research in particle physics—particularly on the abundant, mysterious and difficult-to-detect neutrino. Starting in 1999, a brand-new, 2-mile circular accelerator called the Main Injector was added to the Fermilab complex to increase the number of Tevatron particle collisions tenfold. It was joined in its tunnel by the Recycler, a permanent magnet ring that stored and cooled antiprotons. But before the Main Injector was even completed, scientists had identified a second purpose: producing powerful beams of neutrinos for experiments in Illinois and 500 miles away in Minnesota. By 2005, the proton beam circulating in the Main Injector was doing double duty: sending ever-more-intense beams to the Tevatron collider and smashing into a target to produce neutrinos. Following the shutdown of the Tevatron, the Recycler itself was recycled to increase the proton beam power for neutrino research. “I’m still amazed at how we are able to use the Recycler. It can be difficult to transition if a machine wasn’t originally built for that purpose,” says Ioanis Kourbanis, the head of the Main Injector department at Fermilab. Fermilab’s high-energy neutrino beam is already the most intense in the world, but the laboratory plans to enhance it with future improvements to the Main Injector and the Recycler, and to build a brand-new neutrino beamline. Neutrinos almost never interact with matter, so they can pass straight through the Earth on their way to detectors onsite and others several hundred miles away. Scientists hope to learn more about neutrinos and their possible role in shaping our early universe. The new beamline will be part of the Long-Baseline Neutrino Facility, which will send neutrinos 800 miles underground to the massive, mile-deep detectors of the Deep Underground Neutrino Experiment. Scientists from around the world will use the DUNE data to answer questions about neutrinos, thanks to the repurposed pieces of the Fermilab accelerator complex. When physicists first came up with the idea to build a two-mile linear accelerator at what is now called SLAC National Accelerator Laboratory, managed by Stanford University, they called it “Project M” for “Monster.” Engineers began building it from hand-drawn designs. Once completed, the machine was able to accelerate electrons to near the speed of light, producing its first particle beam in May 1966. 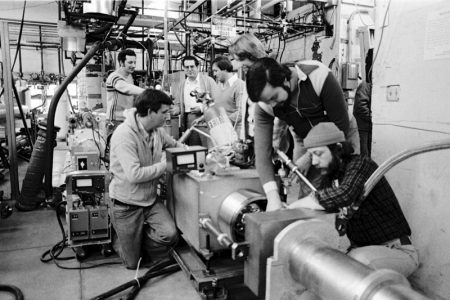 The accelerator’s scientific purpose has gone through several iterations of particle physics experiments over the decades, from fixed-target experiments to the Stanford Linear Collider (the only electron-positron linear collider ever built) to an injector for a circular collider, the Positron-Electron Project. These experiments led to the discovery that protons are made of quarks, the first evidence that the charm quark existed (through observations of the J/psi particle, co-discovered with researchers at MIT) and the discovery of the tau lepton. In 2009, the lab used the accelerator as the backbone for a different type of science machine—an X-ray free-electron laser, the Linac Coherent Light Source. “Looking around, SLAC was the only place in the world with a linear accelerator capable of driving a free-electron laser,” says Claudio Pellegrini, a distinguished professor emeritus of physics at the University of California, Los Angeles and a visiting scientist and consulting professor at SLAC. Pellegrini first proposed the idea to transform SLAC’s linear accelerator. The new machine, a DOE Office of Science user facility, would be the world’s first laser of its kind that could produce extremely bright hard X-rays, the high-energy X-rays that let scientists take snapshots of atoms and molecules. Little about the accelerator itself needed to change. But to create a free-electron laser, scientists needed to design a new part: an electron gun, a device that generates electrons to be injected into the accelerator. A collaboration of several national labs and UCLA created a new type of electron gun for LCLS, while other national labs helped build undulators, a series of magnets that would wiggle the electrons to create X-rays. LCLS used only the last third of SLAC’s original linear accelerator. In part of the remaining section, scientists are developing plasma wakefield and other new particle acceleration techniques. For the X-ray laser’s next iteration, LCLS-II, scientists are aiming for an even brighter laser that will fire 1 million pulses per second, allowing them to observe rare and exceptionally transient events. To do this, they will need to replace the original copper structures with superconducting technology. The technology is derived from designs for a large International Linear Collider [ILC] proposed to be built in Japan. Sending bunches of protons speeding around a circular particle collider to meet at one specific point is no easy feat. Many different collider components work keep proton beams on course — and to keep them from becoming unruly. 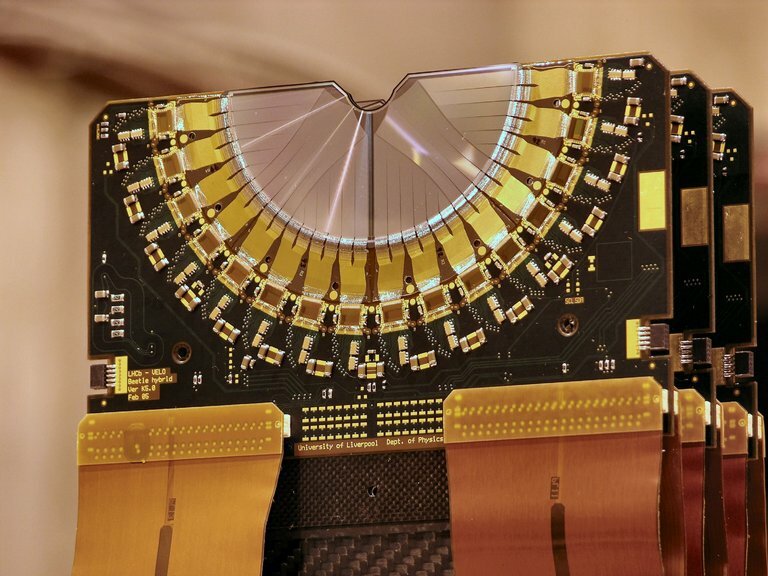 Scientists at Fermilab invented and developed one novel collider component 20 years ago: the electron lens. Electron lenses are beams of electrons formed into specific shapes that modify the motion of other particles — usually protons — that pass through them. The now retired Tevatron, a circular collider at Fermilab, and the Relativistic Heavy Ion Collider (RHIC) at Brookhaven National Laboratory have both benefited from electron lenses, a concept originally developed at Fermilab. “Electron lenses are like a Swiss Army knife for accelerators: They’re relatively simple and inexpensive, but they can be applied in a wide variety of ways,” said Alexander Valishev, a Fermilab scientist who co-authored a recent study for a new electron lens application, which could be crucial to forthcoming colliders. This new type of electron lens, called the Landau damping lens, will be a critical part of a huge, prospective project in particle physics research: the Future Circular Collider at CERN. The FCC would push the boundaries of traditional collider design to further study the particle physics beyond the Higgs boson, a fundamental particle discovered only five years ago. The proposed FCC has to be a high-luminosity machine: Its particle beams will need to be compact and densely packed. Compared with CERN’s Large Hadron Collider, the beams will also have a dramatic increase in energy — 50 trillion electronvolts, compared with the LHC’s beam energy of 7 trillion electronvolts. That involves an equally dramatic increase in the size of the accelerator. With a planned circumference of 100 kilometers, the FCC would dwarf the 27-kilometer LHC. These high-energy, high-luminosity supercolliders all experience a problem, regardless of size: An intense beam of protons packed into the width of human hair traveling over a long distance can become unstable, especially if all the protons travel in exactly the same way. In a collider, particles arrive in packets called bunches — roughly foot-long streams packed with hundreds of billions of particles. A particle beam is formed of dozens, hundreds or thousands of these bunches. Imagine a circular collider as a narrow racetrack, with protons in a bunch as a tight pack of racecars. A piece of debris suddenly appears in the middle of the track, disrupting the flow of traffic. If every car reacts in the same way, say, by veering sharply to the left, it could lead to a major pileup. Inside the collider, it’s not a matter of avoiding just one bump on the track, but adjusting to numerous dynamic obstacles, causing the protons to change their course many times over. If an anomaly, such as a kink in the collider’s magnetic field, occurs unexpectedly, and if the protons in the beam all react to it in the same way at the same time, even a slight change of course could quickly go berserk. One could avoid the problem by thinning the particle beam from the get-go. By using lower-density proton beams, you provide less opportunity for protons to go off course. But that would mean removing protons and so missing out on potential for scientific discovery. Another, better way to address the problem is to introduce differences into the beam so that not all the protons in the bunches behave the same way. To return to the racetrack: If the drivers all react to the piece of debris different ways —some moving slightly to the right, others slightly to the left, one brave driver just skips over the top — the cars can all merge back together and continue the race, no accidents. Creating differentiations within a proton bunch would do essentially the same thing. Each proton follows its own, ever-so-slightly different course around the collider. This way, any departure from the course is isolated, rather than compounded by protons all misbehaving in concert, minimizing harmful beam oscillations. These differences are usually created with a special type of magnet called octupoles. The Tevatron, before its decommissioning in 2011, had 35 octupole magnets, and the LHC now has 336. But as colliders get larger and achieve greater energies, they need exponentially higher numbers of magnets: The FCC will require more than 10,000 octupole magnets, each a meter long, to achieve the same beam-stabilizing results as previous colliders. That many magnets take up a lot of space: as much as 10 of the FCC’s 100 kilometers. The scientific community recognizes the Landau damping nonlinear lens as a likely solution to this problem: A single one-meter-long electron lens could replace all 10,000 octupole magnets and possibly do a better job keeping beams stable as they speed toward collision, without introducing any new problems. The Landau damping lens will join two other electron lens types in the repertoire of tools physicists have to modify or control beams inside a collider. Electron lenses are a lot like Legos: Lego pieces are made of the same material and can be the same color, but a different shape determines how they can be used. Electron lenses are all made of clouds of electrons, shaped by magnetic fields. The shape of the lens dictates how the lens influences a beam of protons. Scientists developed the first electron lens at Fermilab in 1997 for use to compensate for so-called beam-beam effects in the Tevatron, and a similar type of electron lens is still in use at the Brookhaven’s RHIC. In circular colliders, particle beams pass by each other, going in opposing directions inside the collider until they are steered into a collision at specific points. As the beams buzz by one another, they exert a small force on each other, which causes the proton bunches to expand slightly, decreasing their luminosity. That first electron lens, called the beam-beam compensation lens, was created to combat the interaction between the beams by squeezing them back to their original, compact state. 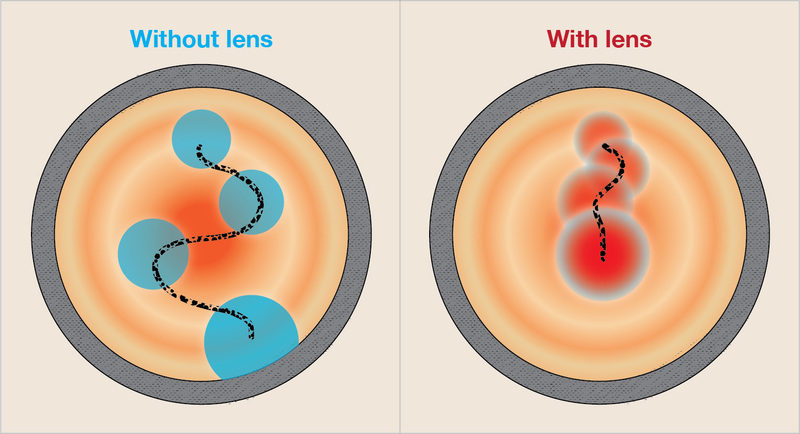 After the success of this electron lens type in the Tevatron, scientists realized that electron beams could be shaped a second way to create another type of electron lens. Scientists designed the second lens to be shaped like a straw, allowing the proton beam to pass through the inside unaffected. The occasional proton might try to leave its group and stray from the center of the beam. In the LHC, losing even one-thousandth of the total number of protons in an uncontrolled way could be dangerous. The electron lens acts as a scraper, removing these rogue particles before they could damage the collider. Both types of electron lens have made their mark in collider design as part of the success of the Tevatron, RHIC and the LHC. The new Landau damping lens may help usher in the next generation of colliders. There were already hints that the top quark didn’t play by the rules in data collected at the Tevatron collider at Fermilab in the US (the same laboratory that discovered the particle in 1995). Around a decade ago, researchers found that, when produced in pairs from the Tevatron’s proton-antiproton collisions, top quarks tended to be emitted in the direction of the proton beam, while anti-tops aligned in the direction of the antiproton beam. A small forward-backward asymmetry is predicted by the Standard Model, but the data showed the measured asymmetry to be tantalisingly bigger than expected, potentially showing that new particles or forces are influencing top-quark pair production. Alas, individually and combined, their results show no deviation from the latest Standard Model calculations. These calculations have in fact recently been improved, and show that the predicted asymmetry is slightly higher than previously thought. This, along with improvements in data analysis, even brings the earlier Tevatron result into line with the Standard Model. Physicists have discovered a particle that is doubly charming. 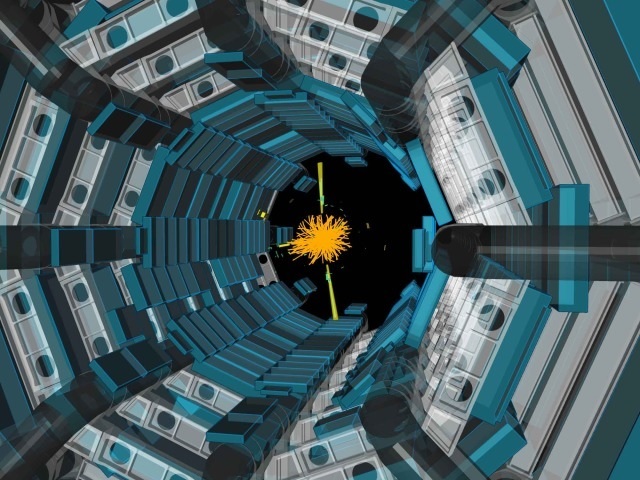 Researchers reported on Thursday that in debris flying out from the collisions of protons at the CERN particle physics laboratory outside Geneva, they had spotted a particle that has long been predicted but not detected until now. The new particle, awkwardly known as Xi-cc++ (pronounced ka-sigh-see-see-plus-plus), could provide new insight into how tiny, whimsically named particles known as quarks, the building blocks of protons and neutrons, interact with each other. Protons and neutrons, which account for the bulk of ordinary matter, are made of two types of quarks: up and down. A proton consists of two up quarks and one down quark, while a neutron contains one up quark and two down quarks. These triplets of quarks are known as baryons. There are also heavier quarks with even quirkier names — strange, charm, top, bottom — and baryons containing permutations of heavier quarks also exist. An experiment at CERN, within the behemoth Large Hadron Collider, counted more 300 Xi-cc++ baryons, each consisting of two heavy charm quarks and one up quark. The discovery fits with the Standard Model, the prevailing understanding of how the smallest bits of the universe behave, and does not seem to point to new physics. Dr. Spradlin presented the findings on Thursday at a European Physical Society conference in Venice, and a paper describing them has been submitted to the journal Physical Review Letters. Up and down quarks have almost the same mass, so in protons and neutrons, the three quarks swirl around each other in an almost uniform pattern. In the new particle, the up quark circulates around the two heavy charm quarks at the center. “You get something far more like an atom,” Dr. Spradlin said. Quark interactions are complex and difficult to calculate, and the structure of the new particles will enable physicists to check the assumptions and approximations they use in their calculations. “It’s a new regime in quark-quark dynamics,” said Jonathan L. Rosner, a retired theoretical physicist at the University of Chicago. The mass of the Xi-cc++ is about 3.8 times that of a proton. The particle is not stable. Dr. Spradlin said the scientists had not yet figured out its lifetime precisely, but it falls apart after somewhere between 50 millionths of a billionth of a second and 1,000 millionths of a billionth of a second. 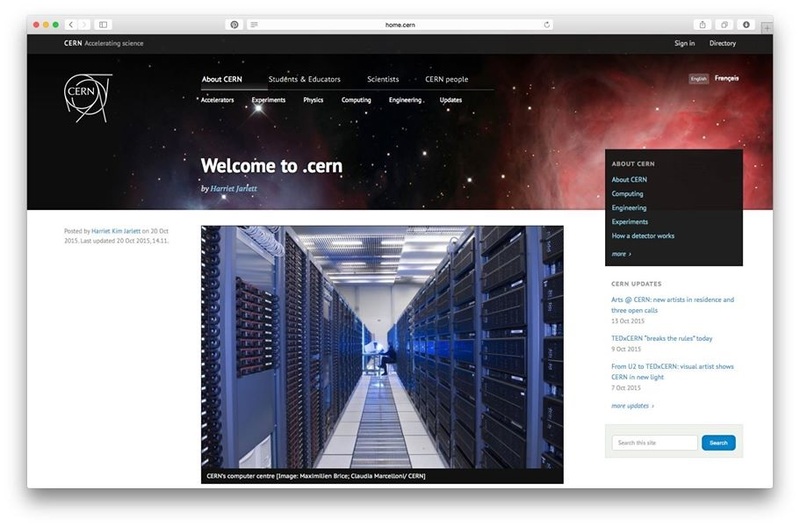 For Dr. Rosner, the CERN results appear to match predictions that he and Marek Karliner of Tel Aviv University made. 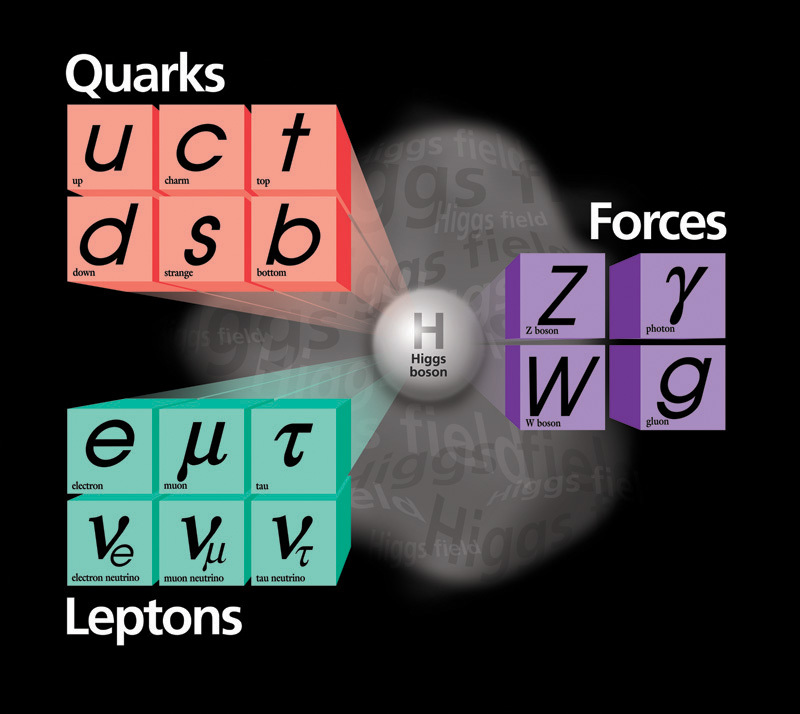 What is less clear is how the new particle fits in with findings from 2002, when physicists working at Fermilab outside Chicago made the first claim of a doubly charmed baryon, one consisting of two charm quarks plus a down quark (instead of the up quark seen in the CERN experiment). The two baryons should be very close in mass, but the Fermilab one was markedly lighter than what the CERN researchers found for Xi-cc++, and it appeared to decay instantaneously, in less than 30 millionths of a billionth of a second. Theorists like Dr. Rosner had difficulty explaining the behavior of the Fermilab particle within the Standard Model. “I didn’t have an honest alternative to allow me to believe that result,” he said. But he said the Fermilab findings still stood, too. He acknowledged that the two results do not readily make sense together. It is possible one of the experiments is wrong. Researchers at other laboratories, including at CERN, have sought to detect the Fermilab baryon without success. Dr. Spradlin said he and his colleagues are searching the same data that revealed the Xi-cc++ for the baryon with two charm quarks and one down quark. 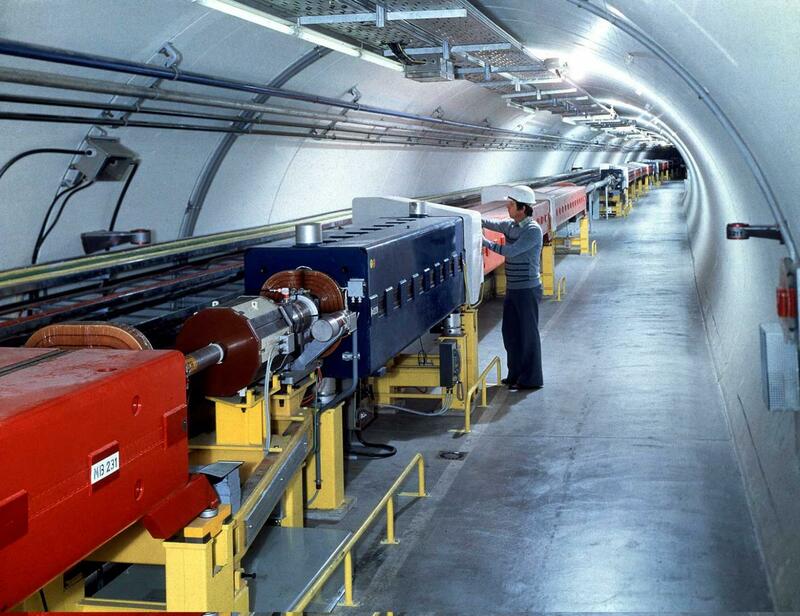 That could confirm the Fermilab findings or reveal a mass closer to theorists’ expectations. I presented an earlier post from LHCb, but it contained no reference to the paper in Physical Review Letters. 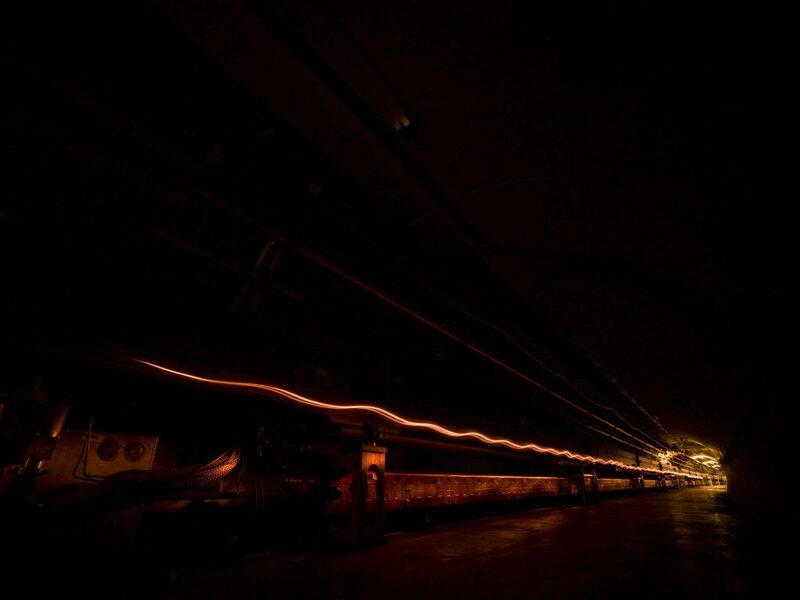 Fermilab’s Tevatron was the first particle accelerator to make use of an electron lens, a technique that allowed the machine to compensate for destabilizing forces unavoidably generated by the colliding beams. Proposed in 1997, the lenses were installed in 2001 and 2004 in the Tevatron, where they demonstrated beam-beam compensation. They were also used in the removal of unwanted particles. The innovation earned Fermilab scientist Vladimir Shiltsev a European Physical Society Accelerator Prize. When I started at the lab in December 1977, work on the dipole magnets for the Tevatron was well under way in what was then called the Energy Doubler Department in the Technical Services Section. My first project was to work on the quadrupole magnets and spools, which hadn’t really been started yet. The spool is a special unit that attaches to each quadrupole and the adjacent dipole. It contains what we used to call “the stuff that wouldn’t fit anywhere else” – correction magnets and their power leads, quench stoppers to dump the energy from all the magnets, beam position monitors, relief valves, things like that. At the time, we were located in the Village in the old director’s complex, which now houses the daycare center. We had a large open area where the engineers, designers and drafters worked and a small conference room where we kept up-to-date models of some of the things we were working on. For several weeks we worked feverishly on the design of the quadrupole and spool combination — we in the design room and the model makers in the model shop on their full-scale models. We would work all week, then have a meeting with the lab director, Bob Wilson. Dr. Wilson would come out to see how we were doing, but more importantly to see what our designs looked like. It turns out he was very interested in that and very fussy that things — even those buried in the tunnel — looked just so. After every one of those meetings we’d walk back into the design room and tell everyone to tear up what we’d been working on and start over. The same would hold for the model makers. This went on for several weeks until Dr. Wilson was happy. We began to really dread going into those meetings, but in the end they served us very well. Heavy quarks produced in high-energy collisions decay within a tiny fraction of a second, traveling less than a few centimeters from the collision point. To study properties of these particles, Fermilab began using microstrip detectors in the late 1970s. These detectors are made of thin slices of silicon and placed close to the interaction point in order to take advantage of the microstrip’s tremendous position resolution. 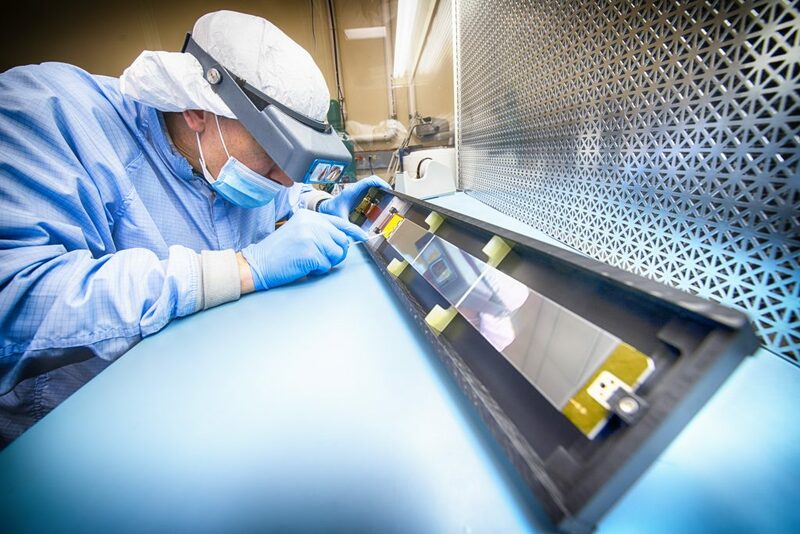 Over time, Fermilab developed this technology, improving our understanding of silicon’s capabilities and adapting the technology to other detectors, including those at CDF and DZero. In 1977, theoretical physicists at Fermilab — Ben Lee and Chris Quigg, along with Hank Thacker — published a paper setting an upper limit for the mass of the Higgs boson. This calculation helped guide the design of the Large Hadron Collider by setting the energy scale necessary for it to discover the particle. The Large Hadron Collider turned on in 2008, and in 2012, the LHC’s ATLAS and CMS discovered the long-sought Higgs boson — 35 years after the seminal paper. Sight of the planned Superconducting Super Collider, in the vicinity of Waxahachie, Texas. Cancelled by our idiot Congress under Bill Clinton in 1993. We could have had it all.